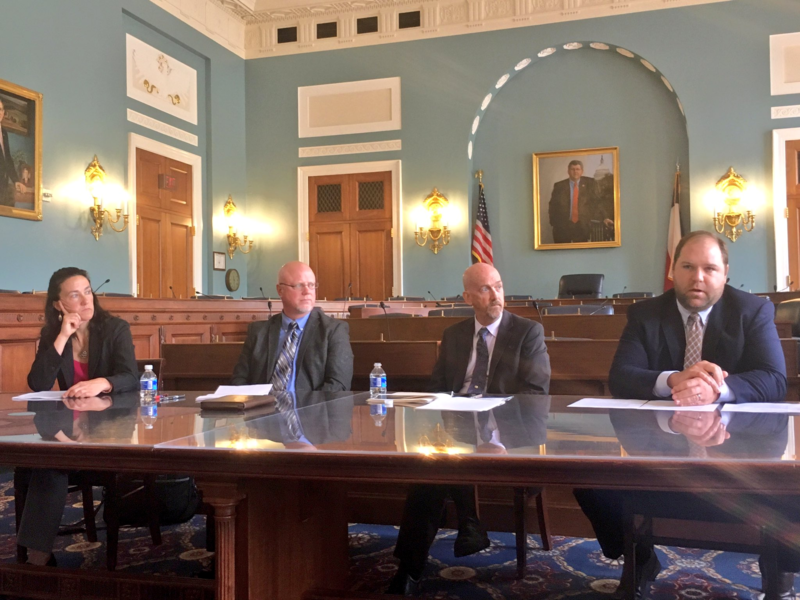 Rep. Bruce Westerman (R-AR), co-chair of the Congressional Biomass Caucus and Working Forests Caucus, sponsored a congressional briefing on bioenergy this week. Moderated by Julie Tucker, national lead for renewable wood at the U.S. Forest Service, the panel featured three experts on the carbon cycle, U.S. forest growth projections and a biomass/coal co-fire project in Arizona. Dr. Bob Malmsheimer of the State University of New York College of Environmental Science and Forestry and an author of the forests chapter in the 2014 National Climate Assessment, gave a presentation on the role of bioenergy in maintaining a vibrant forest products sector. He emphasized that bioenergy and forest products markets incentivize landowners to cultivate their lands rather than selling them, and to keep forests healthy for optimal harvests. He has previously presented his team's research in the paper "Forest Carbon Accounting Considerations in U.S. Bioenergy Policy." Dr. Steven Prisley of the National Council for Air and Stream Improvement (NCASI), presented research on the growth of forest and carbon stocks in the United States over the past century. His data showed that forests have grown steadily, and have remained stable since the 1950s despite overall booming lumber, housing and pulp/paper markets. Dr. Prisley made the case that biomass, particularly residues replacing the use of fossil fuels, can be carbon beneficial. Finally, Lane Dickson discussed the Salt River Project's testing of co-firing with biomass at its coal facility in Arizona. He said the company is dedicated to improving forest health in the state. The panel, well-attended by Congressional staffers, was followed by a Q&A session. This event follows Rep. Westerman's August Seed2Sawmill tour in his home state of Arkansas, which included a pellet mill tour. The New York Times this week published the latest of several stories critical of biomass and the carbon neutrality amendment included in the Senate energy bill passed earlier this year. The story presented questionable research on biomass emissions and lacked input from any industry sources. It also disregarded the market forces at work that prevent the industry from "burning forests." "I could go on and on about the biggest cause of deforestation worldwide is a better economic return being offered by some other use. I could point out that forest inventories in this country have been stable for a century. I could talk about the army of actual forestry professionals that embrace forest-based biomass energy because it helps fund robust forest management practices. ...The bottom line however, is I could write a rebuttal like this nearly every day of my professional year. Why? Because so many folks in the mainstream press have fallen for the scorched earth myth being perpetuated by an increasingly familiar handful of groups. The terminology. The talking points. The imagery. It's all so familiar." Many industry and non-industry groups pushed back on social media and in the comments section of the New York Times story. After five years of punishing drought, I am more fearful than ever that increasingly destructive and unpredictable fires will exceed our capacity to put them out quickly and protect the lives and property of Californians. And the odds are high that the state will continue to grapple with extreme fire seasons long after the current drought ends. During my travels in California, I have seen firsthand the enormous number of trees that have been killed by drought and bark beetle infestations. The U.S. Forest Service estimates that there are 66 million dead trees on our state's public lands, half of which are concentrated in the Sequoia, Sierra and Stanislaus national forests. The lack of water, combined with the proliferation of tree-killing beetles that thrive in dry conditions, has created a tree mortality crisis unlike any we've seen in recent decades. But this growing public-safety threat has not received the attention or resources it deserves. That needs to change. The pellet stove showroom at Hoffman's Outdoor Power & Repair is hopping because of what's in the hopper. "Wood pellets," says Glen Hoffman, scooping a handful from the hopper of a stove on display at his store near Halifax. "It's basically waste sawdust that they are taking and compressing into a little pellet, and it's designed so that the stoves can feed it through, and it does it automatically, and it's all temperature controlled." Wood pellets have long been considered a reliable form of alternative home heat, often used to replace or supplement traditional furnace fuels like gas, oil, and electricity. Not unlike coal or traditional firewood, the use of a pellet stove can add ambiance and cost savings during the fall and winter, according to Hoffman. Alabama has been one of the wealthiest states caused by their natural resources for years. Ensuring future generations have the benefits of a surplus of natural resources is one of the main goals of Alabama's Department of Agriculture, and biomass looks like the way to do that. Biomass consists of any organic matter that can be used as fuel, especially within a power station to generate electricity. Alabama has a plethora of wood, an organic fuel. Using wood in pellet form is one of the most energy efficient ways of using this biomass. The pellets are small, compacted parts of sawdust and other lumber and wood waste and burn easier than almost anything. The process begins with harvesting wood-processing waste like tree scrapes, milled lumber, and broken down wood products. All the wood is then ground together and compressed under high pressure to rid the wood of any moisture. The pellets are then compacted and used as a renewable fuel for various industries.